Software developers, scientists, researchers, engineers, students, or programming hobbyists with basic familiarity in Python will find this book interesting and informative. People familiar with basic programming constructs in other programming language can also catch up with some brief reading on Python. No GUI programming experience is expected. This book will help you master the art of GUI programming. It delivers the bigger picture of GUI programming by building real-world, productive, and fun applications such as a text editor, drum machine, game of chess, media player, drawing application, chat application, screen saver, port scanner, and many more. In every project, you will build on the skills acquired in the previous project and gain more expertise. You will learn to write multithreaded programs, network programs, database driven programs and more. You will also get to know the modern best practices involved in writing GUI apps. With its rich source of sample code, you can build upon the knowledge gained with this book and use it in your own projects in the discipline of your choice. An easy-to-follow guide, full of hands-on examples of real-world GUI programs. 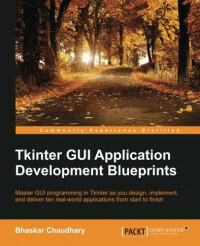 The first chapter is a must read as it explains most of the things you need to get started with writing GUI programs with Tkinter. Each subsequent chapter is a stand-alone project that discusses some aspects of GUI programming in detail. These chapters can be read sequentially or randomly depending upon the readers experience with Python. If you need help building web applications with the Lift framework, this cookbook provides scores of concise, ready-to-use code solutions. You’ll find recipes for everything from setting up a coding environment to creating REST web services and deploying your application to production.